Incidental finding of TSC evaluation: Asymptomatic SEGA may be identified on CT and/or MRI scans during the evaluation of patients with TSC. 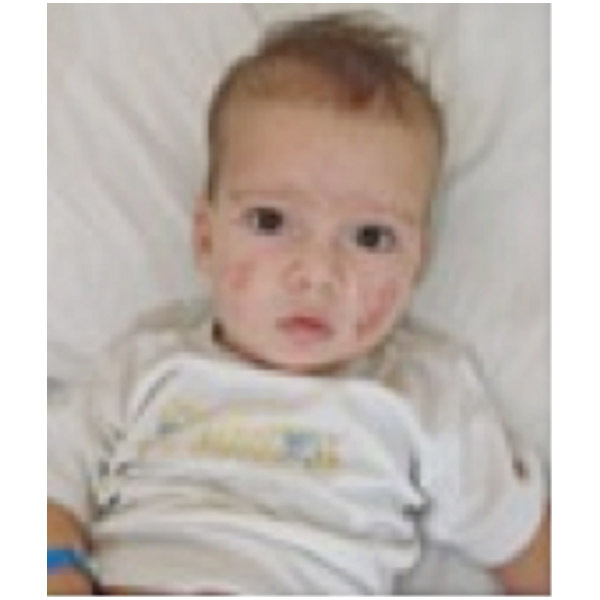 Vogt triad – seizures, skin lesions, and tubers: The classical presentation of the child with TSC is the so-called Vogt triad, namely, seizures, cutaneous lesions, and intracranial tubers. Elevated ICP: SEGA symptoms are usually a result of obstructive hydrocephalus because of mass effect around the ventricular system, commonly at the intraventricular foramen (of Monro). This hydrocephalus, or increased pressure of CSF, results in headaches, vomiting, nausea, and vision problems (blurred or double vision). Seizures: Seizures are one of the three components of the Vogt triad, and status epilepticus is a major cause of morbidity in patients with TSC. The seizures are not directly caused, nor is their likelihood increased, by the presence of SEGA (23,30). Cortical tubers are the most likely seizure foci, rather than SEGAs or subependymal nodules. Therefore, SEGAs are not likely to be independent risk factors for seizure-induced deaths. Shagreen patch: Shagreen patch is a section of thickened, irregular, elevated pebbly skin like an orange peel or leathery texture usually found on the lower back, buttocks, upper thigh, and nape of the neck. The name is derived from the French phrase “peau chagrinee,” which means “skin with the appearance of untanned leather.” It usually does not cause any problem other than being unsightly if it is in a location that can be seen by others. There is no treatment for Shagreen patch. Slow worsening of seizures, ICP symptoms, or behavioral abnormalities: These neoplasms evolve over several weeks or years. They may be identified when small and asymptomatic on a screening CT scan or MRI in a child with TSC. Growth of the SEGA may cause increased ICP symptoms, epilepsy recrudescence, and behavioral modifications. Growth of SEGAs may worsen epileptic seizures in terms of frequency and intensity, probably through the associated hydrocephalus and/or the direct irritation of the interventricular septum. However, epilepsy is most often related to the cortical tubers in TSC. Exceptionally, onset of severe symptoms may disclose the tumor through acute hydrocephalus, an intraventricular hemorrhage, or even a sudden death (13, 33). SEGAs grow while subependymal nodules do not: Serial imaging studies have proven that SEGAs have the potential to grow (3–4 mm per year) and therefore to become symptomatic. Subependymal nodules generally do not possess this growth potential. In the series of Cuccia et al., all subependymal nodules (about 70 nodules), except those near the foramen of Monro, remained unchanged or even decreased in size (7). Larger tumors deform anatomy and create symptoms: Large SEGAs induce a deformation of the foramen of Monro, leading to difficulties in operative hemostasis and problems of tumor dissection from surrounding structures such as the fornix, the head of caudate nucleus, the ependyma and its veins, and the intraventricular septum. As a result of the expected progression and the increased difficulty of removing a larger tumor, a minority advocates removal of asymptomatic SEGAs. 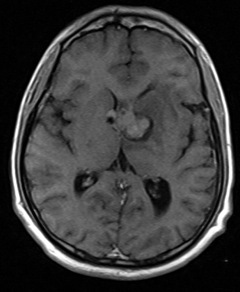 T1-weighted axial MRI of a SEGA: This 24-year-old patient with SEGA, scanned after head injury, had no other stigmata of TSC. There is no hydrocephalus, and thus the patient is currently under observation. Slow: Slow growth over years can become problematic and require surgery. Therefore, SEGAs, when discovered, should be followed with serial scans on an annual basis for the first 2-3 years and then duration for imaging can be decided on an individual case-by-case basis. Axial CT scan showing lesion at foramen of Monro: This lesion is more likely to be SEGA than a subependymal nodule because of its location, and thus it requires close follow-up with serial MRI. EVD: Temporary CSF diversion may be done in a life-threatening situation prior to definitive surgery. mTOR inhibitors: Lesions near the foramen of Monro have a tendency to grow and may be treated with mTOR inhibitors upfront for stabilization or at the first evidence of progression. Anticonvulsants: Patient should have optimum anticonvulsant medication apart from checking regular preoperative hematological and biochemical parameters. HOB, positioning and activity: These are all as tolerated. IVF and rate: Adequate hydration must be provided for maintenance of hemodynamics. CSF drainage parameters: EVD should be performed if there is gross uncompensated hydrocephalus.